SuperSync has announced the release of SuperSync 3.1, a new version of its music library synchronization software for Mac OS X and Windows. It costs $29 for a two-license registration, and updates from the previous version are free. SuperSync helps you find and eliminate duplicate music tracks and synchronize multiple music libraries. 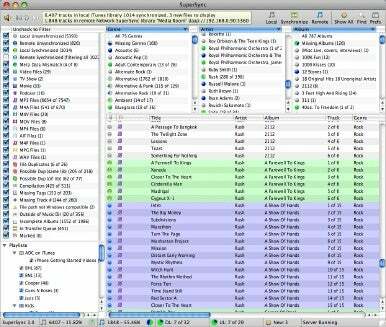 SuperSync lets iPod and iTunes users display two music libraries at once, allowing users to visually merge libraries, duplicate files, make backup libraries, update metadata and synchronize playlists. New to the 3.1 release are two new Web-based interfaces. One interface is optimized for iPhone Safari, while the other is optimized for modern Flash-enabled Web browsers. Both formats rely on AJAX for displaying a single Web page that shows playlists, artists, albums and genres; a search function is also embedded that helps you find specific tracks. Support is included for Universal Plug and Play (UPnP) routers, and a new library rescan feature helps find tracks that are missing or recently added. Also new is an advanced duplicate finding feating which helps identify tracks that are in the same library more than once, but containing modified MP3 or AAC tag metadata. Five- and 10-machine licenses are also available. A demo is available as well.